Filter by Standard Account Format Croft Ed. Deluxe Ed. 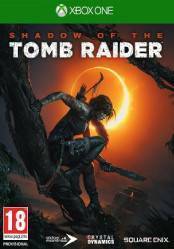 Attention: This version of Shadow of the Tomb Raider is for Xbox One and depending on the store where you buy it you can come with some extras or others. This price list includes the Deluxe edition of the title, but not the Croft Edition. Don't forget that digital versions may have geographical restrictions on their activation, so check the specifications in each of the stores. In this new installment of Lara Crofts we will put ourselves in the shoes of the young adventurer and with her we will become the mature treasure hunter. We'll go through deadly jungles, over terrifying tombs and all kinds of locations all over the world. Our goal in this installment will be to save the world from a Mayan apocalypse. The use of the environment together with Lara's new skills will make her a true expert in combat: Hitting by surprise and sneaking through the jungle like a jaguar, using the mud as a camouflage and instilling fear in enemies to sow chaos. We will also find new tombs, more terrifying than ever and full of traps that will require all our cunning. Been hearing a lot of great things about this game, haven't seen any gameplay yet, i'll have to watch some on youtube, if it looks good ill most def but it in the future. SHE HAD ENOUGH!! | Shadow Of The Tomb Raider Episode 7 Gameplay!! !